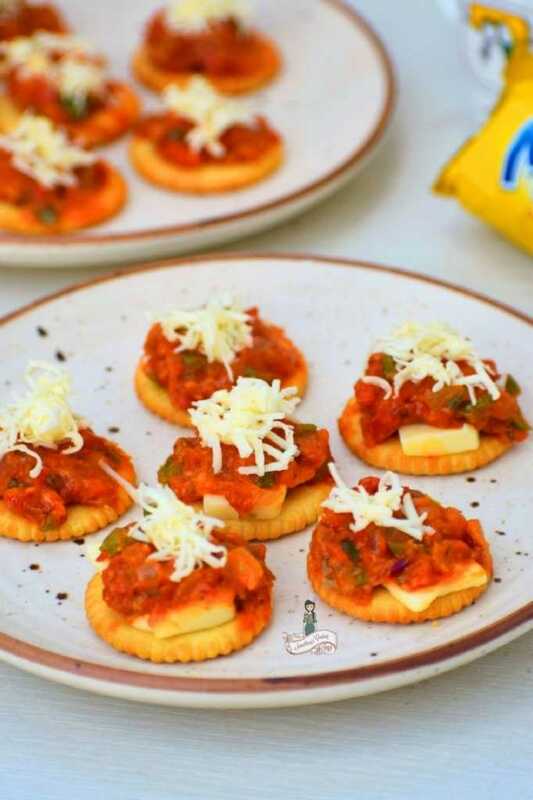 A quick tangy, tasty finger food loaded with cheese and is perfect for a party snack. Sounds good? 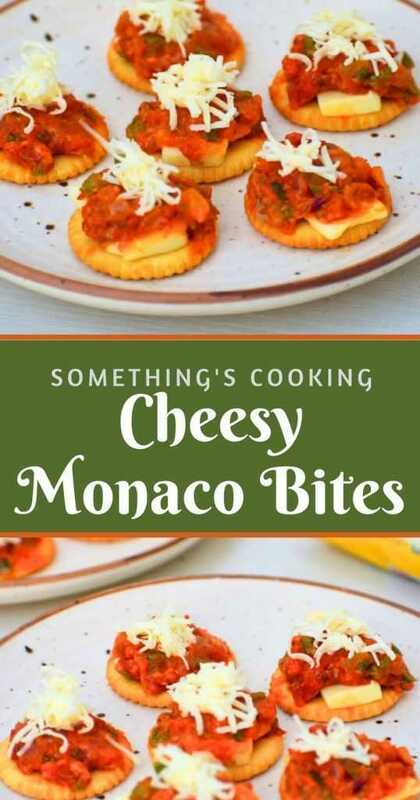 No one can ignore the Cheesy Monaco Bites, especially the kids. Today I will tell you about some Must-Haves in an Army Wife’s wardrobe. No, it’s not a Gucci handbag or MAC lipstick or a Dorothy Perkins dress. These are some essentials that would help you survive the theme parties, the official parties, the ‘whatever’ parties or the unexpected guests at home. Sarees: My bet is always on a good silk saree for all the formal functions- elegant and chic and a definite trend-setter! Hailing from the south, I am blessed to have gotten a fairly good collection of them. Then you should own a black and white saree for the black and white theme. Preferably a polka dotted one so that you can use it on a retro theme as well. Floral prints come next for the Garden party, flower themed party or Coffee mornings. You ought to have a pair of your traditional outfit – a Kerala saree for a Malayalee, a Punjabi suit for a Punjabi etc. Own that one masterpiece saree with a mural painting, Warli painting, Kalamkari or Devnagiri script to help you stand out. You should also own a complete Winter Wardrobe from trendy coats to sweaters to shawls (you should actually get a Pashmina out of your husband’s wallet. I’m on it! 🙂 ) to blouses to suits, they are worth it. Because you know you are going to get posted to some mountain soon! Own some good pair of formals for all the Golf matches and sports you are invited in. The current trend includes palazzos and long kurtis. Sports shoes, stilettos, and wedges come next with also some good wallets and bags. The most imperative thing now! I have always been skeptical about wearing shorts or three-fourths at home. Yeah, at home. And so is he. He goes blue when I wear them. Of course, I was annoyed in the beginning. And then I knew why. 🙂 You’ll have unexpected visitors. Maybe it’s your Sahayak Bhaiya who roams around at home all the time, or the MES guy who rings the bell every other hour, or someone asking for Saab’s signature, or mine for a ladies meet, or someone announcing Saab’s gaadi. What comes in handy then? A wrap around, of course! I have at least five of them. Invest in at least one, I say. 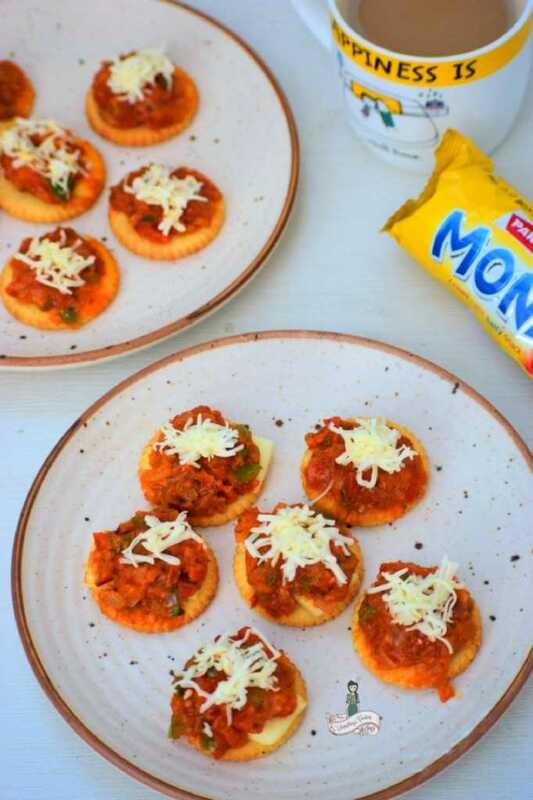 A perfect tea-time snack, Cheesy Monaco Bites can be made in a jiffy. This is also a great option for your kid’s party or when you’ve unexpected gifts at home. I do not need a special occasion for preparing this one. I love to savor it occasionally with my evening cup of adrak chai. Made with everyday ingredients, you must definitely try out this one this weekend. Click a pic and send me across? I will feature it on my new page The Reader’s Space! 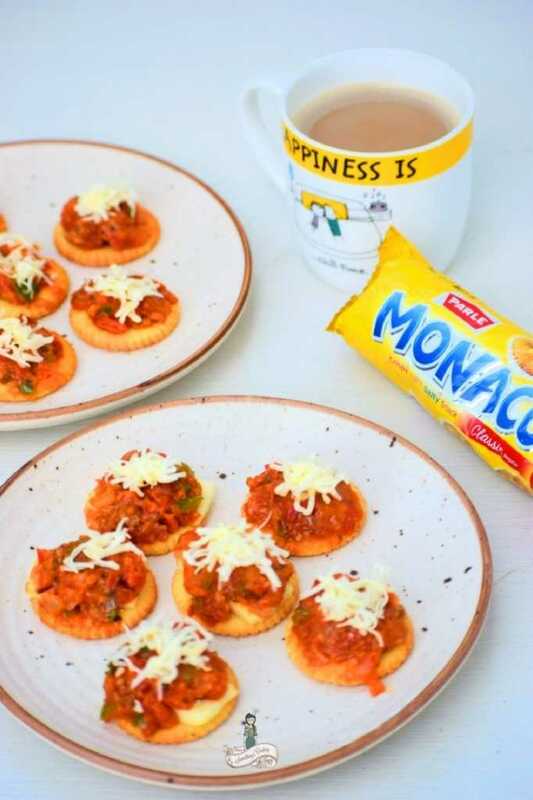 A perfect tea-time snack, Cheesy Monaco Bites can be made in a jiffy. This is also a great option for your kid's party or when you've unexpected gifts at home. Heat butter in a pan. Add the veggies and saute for a couple of minutes. Add the flour and mix. Let it cook for a couple of minutes. Add milk and mix well. Remove from fire. Add grated cheese, oregano, schezwan sauce, and paprika. Mix. 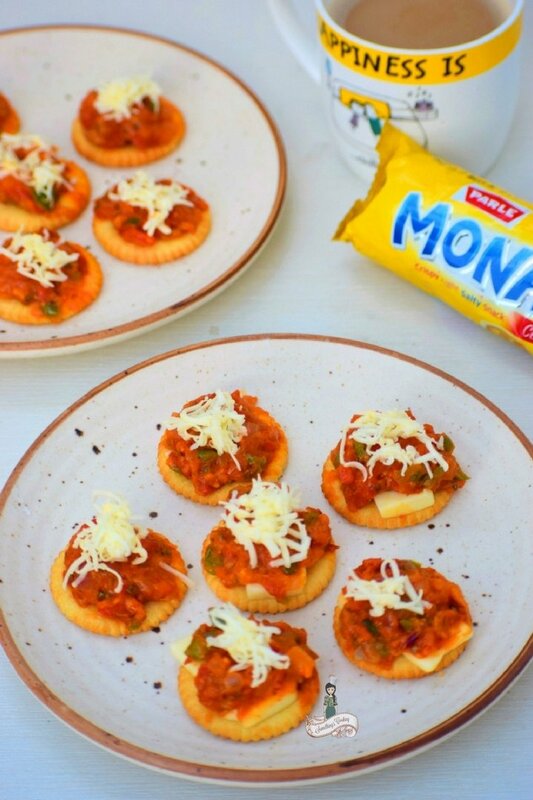 Take a monaco biscuit and place a quartered cheese slice. Scoop in a teaspoon of the veggie mix and top it on the biscuit. 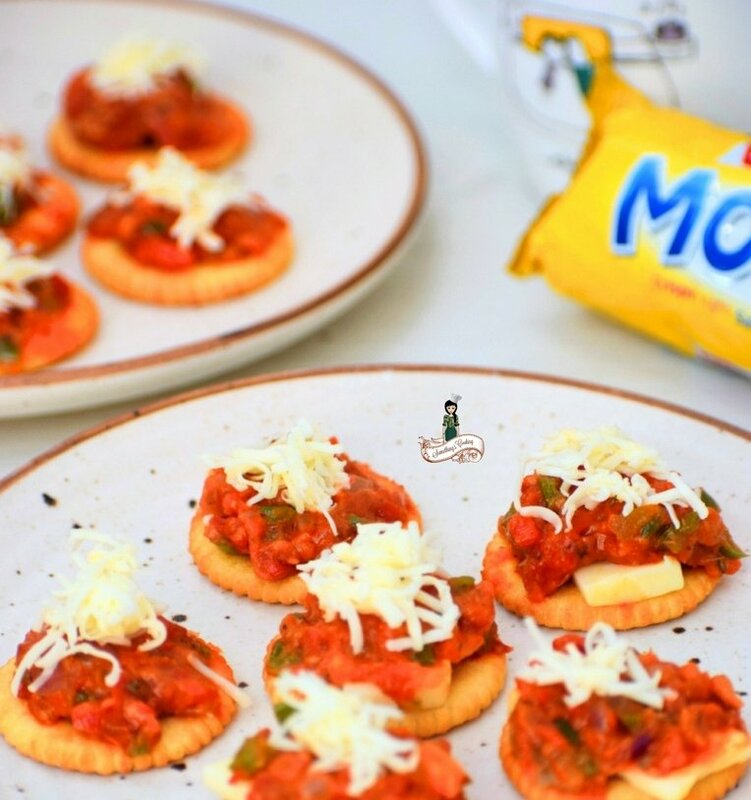 Garnish with grated cheese. Oh this is an absolute favourite at home. I do make it with different toppings. But never one with schezwan sauce as the base. .. This is easy and quick recipe. My kid loves it. U just need Monaco biscuits. And best if you have unannounced guest and you want to spend time talking with them instead of cooking. Love that recipe. Sounds perfect for a kiddie party too. Kids I think eat anything with cheese in/on it! Being an army wife seems daunting going by the number/variety of clothes one needs. I would have been an epic fail at this, given that I haven’t worn a sai in a decade. 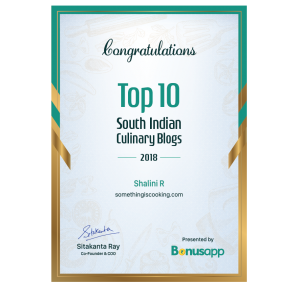 I LOVED this post, Shalini! Not only for the recipe, but also for the wardrobe tips you gave. I love reading/listening/talking about clothes. I too love sarees! And, food! And, yes, dogs! Ditto ditto! Just one question, Shalz, doesn’t the biscuit get soggy? I’ve always wanted to make it, but this is my peeve. No, it never did for me! I guess that’s what adding the flour does. It dries out the mixture and the texture would be that of a paste. Try it out once. I tried eating after about 30 minutes and yet the biscuit wasn’t soggy.